I seem to have accidentally (but very happily!) become an advocate for using reusable nappies over the last few months and have been answering lots of questions from ‘real life’ friends, people in my facebook birth month group, a few on twitter and some on instagram too! I thought I should gather all the cloth nappy FAQs here in the hopes that they will help other people who have questions about cloth! I’m stupidly excited to be using cloth nappies on our new arrival from the start too, how cute is that nappy!? You can read all about that in this post, and see what the Birth to Potty kit from TotsBots looks like! Q: What is the easiest reusable nappy to use? A: This really depends on you and your child’s nappy-needs (are they a heavy wetter, for example) but I personally prefer ‘All in One’ nappies (or AIO) as they are the most like disposables and so quick to put on. The Easy Fit from TotsBots fit from 8lbs to 35lbs, can be chucked in the machine and tumble dried too. They really are as simple as disposables to use, with velcro tabs where the ‘sticky’ tabs would be on a disposable. The video below shows just how easy they are to use! There is also a useful glossary of Cloth terminology here which might be useful! Q: What do I need to prepare to use cloth? How many nappies will I need to get? A: I would say around 20 would be ideal, if you can wash every 2/3 days. A younger baby will need changing more often so you may need to wash every 2 days with 20 nappies until they need changing less. Athena at 20 months goes through 5/6 nappies per day (including one overnight) but isn’t a particularly heavy wetter. Some non-bio detergent or ideally a cloth nappy specific washing powder. You will need to pre wash your nappies before use to build up their absorbency, but after the first wash with detergent (to get rid of anything left over from manufacturing etc) you can just keep on washing with no need to dry in between. Read this guide on Tots Bots for more info. Q: Cloth nappies are expensive though, will I actually save money? a: Yes, the initial outlay is more than buying a box of nappies from the supermarket, but your baby could be wearing the same nappies from birth to potty! You could be saving up to £500 per child if you use cloth from birth to potty training, and that INCLUDES the cost of washing detergent, water and electricity to run your washing machine! Think what you could do with that £500, what experiences you could help your child experience with it! You can also save money buy buying second hand nappies too (which is a great way to find the types that suit you best) and when you buy second hand you don’t need to pre wash, hurrah! Don’t forget that if you take good care of your nappies you can sell them on for a good amount too once you’re little one isn’t in them any more, or you can use them on your next baby (or babies!) and really make your money go further! Q: What about Nappy rash, won’t it happen more with cloth than disposables that soak all the pee away? A: In my experience no! Think about the chemicals in the disposables that soak the pee up, that’s not there in cloth. The only time Athena had a nappy rash (so bad that the doctor had to prescribe special cream to help get rid of it) was when I was newly pregnant and couldn’t face changing poopy/smelly nappies without heaving due to morning sickness so she was in disposables at home for a few weeks as well as her two days at nursery. I felt awful as I could have prevented it had I not has such a sensitive stomach/sense of smell. I find using fleece liners really help to wick away any dampness and as long as nappies are changed in a timely fashion you shouldn’t get any nappy rash. It’s worth noting that if you do you need to use nappy cream then best to use disposable liners so that you don’t clog up the cloth nappy fibres with it as it may affect absorbency! Q: How do you deal with the poop? A: It isn’t as bad as you’d think! Using a liner will stop the poo from getting on the nappy itself 9 times out of ten. Once your little one has started weaning then the poo becomes more solid, and can often be popped right into the toilet from the liner without you needing to faff about. For anything less solid I tend to hold the liner into the stream of the water and flush, which rinses most of it off then I just pop the liner into the dirty nappy bucket! If the nappy has been ‘got’ too then this can be rinsed in the same way in the loo, or under a tap. You don’t need to touch the nappies once they’re in the bucket either as you just lift out the whole net bag and stick it in the machine! Q: I don’t have a washing line so it will take me ages to dry them won’t it? A: Nor do I! I live in a first floor flat so have no outside space at all! 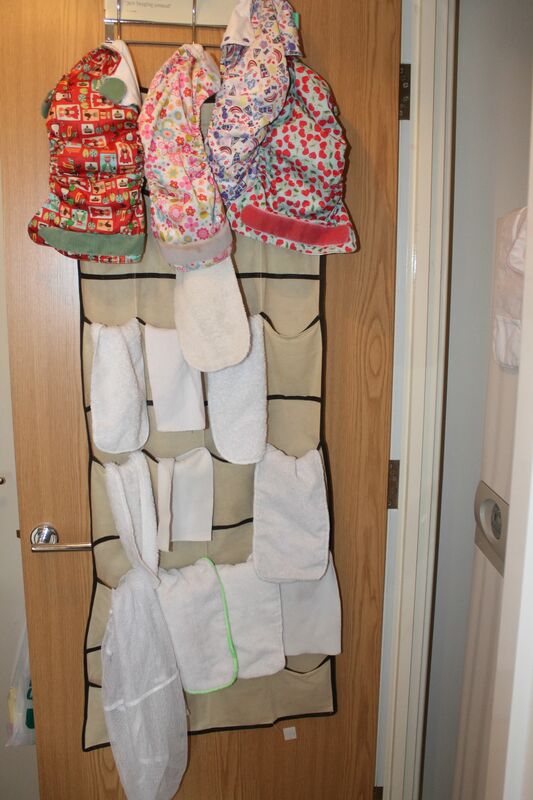 I have hung up a cloth shoe rack on the inside of our boiler cupboard door and hang the nappies in there, everything dries overnight with the exception of a few bamboo boosters that take a little longer. You can also tumble dry most nappies too, although I only do so when really necessary to save electricity! Sometimes if your nappies get a stain then leaving them out in the sun can help to bleach it out, but I just put them on the windowsill on a really sunny day and this works fine! And if the answers above didn’t persuade you that Cloth isn’t as tricky as you may have thought then here are some more facts that should help persuade you! Opting to use reusable nappies will divert 4,000 nappies from landfill per baby if used from Birth to Potty. That adds up to almost 2 tonnes of landfill waste that will take up to 500 years to decompose. Using reusable nappies for your baby is not only up to 40% better for the environment, its will save as much as £500 per baby including the cost of washing too. TotsBots are the leading UK manufacturer of cloth nappies in the UK and are Oekotex certified too which means no nasty chemicals are next to baby’s bum! The Birth to Potty kit contains all the nappies and accessories you need for your baby from birth. With a selection of Rainbow Easyfit V4 nappies that are perfect for daytime and award winning Bamboozle Stretch for nights, you are sorted until your little one makes the step from nappies to proper pants! So, if you have any other questions at all then feel free to leave them in the comments or tweet me! Next Post Brighton Foodies Festival – 3 pairs of tickets up for grabs! Oh wow! That little nappy is so cute! I must admit I just assumed that cloth nappies were exactly that, nappies made from a bit of cloth! I stand corrected and they don’t actually seem that hard to use! Oh wow, I didn’t really ever think about what happens to the normal nappies that get chucked! 4000 is LOADS, and a £500 saving is pretty good too! I’m not anywhere near thinking about babies yet but perhaps using these types of nappies is on the cards when it does happen!